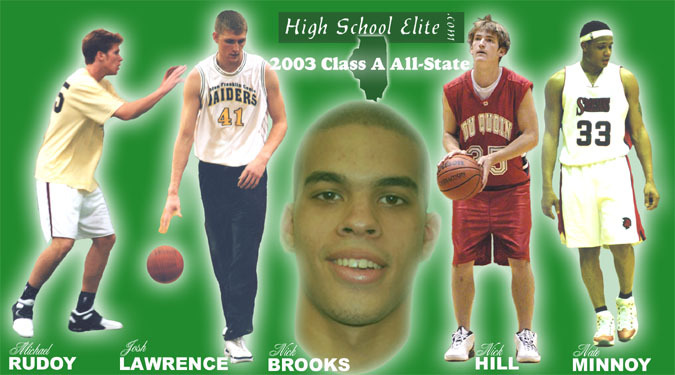 HighSchoolElite.com's 2003 first-team Class A all-state squad. To start the year, he led the Maroons out of the gate with a 20-0 record and No. 1 spot in Class A. After slipping a bit, his team bowed out to Mt. Carmel (at Lawrenceville) in the regional final with a 24-4 record. Coming off an all-state season as a junior, this versatile forward averaged 24 points and seven rebounds this season. Committed to Butler. For a 28-5 team, he averaged 23 points as his teams leading scorer. The Indians lost to fourth-place Cairo in the sectional final. Had a season-high 36 points against Nashville to clinch the conference title. Is a star in football also as the teams standout quarterback, but will pursue basketball in college as a shooting guard. Committed to Western Kentucky. As the only Division I athlete to ever come out of Ashton High School (his school coops with Franklin Center), he averaged 20 points for a 15-13 team that fell to Hinckley Big-Rock in the regionals. A combo forward, his team started the year 7-1 with its only loss coming by a narrow margin in overtime, but then his Pirates took a downward spiral. Committed to Wisconsin-Green Bay. Leading his academically-known school all the way to the sectional finals, the Romans fell to Driscoll, where he had 39 points and 15 rebounds in a losing effort to close his high school career. Averaged 23 points and 13 rebounds for a 27-4 squad as a combo forward. The son of an NBA agent, Herb. Uncommitted. Transferred from Mount Carmel, where he was a starter as a freshman. At a bulldozing 200 pounds, he averaged 17 points, seven rebounds and shot 62 percent from the floor as the leading scorer on the state champion Spartans. With the championship, he helped a Chicago school win the Class A title for the first time since 1985 when Providence St. Mel accomplished that feat. Was held to 11 points and seven rebounds in the championship win over Mt. Carroll, 58-53, but averaged 16 points and eight rebounds in the two games prior. Tremendously skilled on the court, he plays downlow in the post for the Spartans due to a lack of size. Averaged 24 points and 12 rebounds while shooting 60 percent from the field on the year. Passed the 2,000 career-point mark as his teams leading scorer. Averaged 25 points and 10 rebounds in his three games at the Class A Elite Eight, which his team won second place. Was the title games high scorer and rebounder with 26 and 15, respectively. Uncommitted. He is his schools all-time leader in steals and assists as a four-year starter. This slick point guard averaged 19 points, three assists and two steals this season. In his four years with the Bombers he helped them to over 80 wins. Committed to Southeast Burlington Iowa Junior College. The leading scorer and rebounder for the No. 1 Class A team going into the playoffs. Averaged 14 points and 12 rebounds on the season. His team was upset in the sectional semifinals by Breese Central. Uncommitted. Led his team in scoring with a 22-point per game average. Helped the Pilots to the state semifinals where they fell to Mt. Carroll. Made over 80 three-points this season from the shooting guard position. Averaged 21 points as his team's leader in points and rebounds. Already scored over 1,000 career points as a two-year varsity starter. His team fell to Cairo in the regional finals. Averaged 18 points and 11 rebounds for a 14-6 ball club that bowed out early (first round) in the state playoffs against Momence. Is staring on his schools baseball team as a hard-hitting first baseman with recruiting interest coming from both sports. Undecided but expected to pursue his first love of basketball in college. Taking care of business on the court, he averaged 23 points, five rebounds, four assists and three steals a game as a do-it-all guard. However, the classroom was a different story for Herbert AKA "J.R." Forced to take a similar path as 2002 Manley star David Harper, he will have to work on getting his General Education Diploma (GED) this summer, then plans on enrolling in an out-of-state junior college. Manley lost in the second round of the city playoffs to eventual second place finisher Julian. The Wildcats got to the first round of the sections for the Class A State Tournament, falling to Latin. Helped guide his team to the Elite Eight as a sophomore when he averaged 10 points as the starting center. Raising the average to 14 points last year, he guided his squad to the sectionals. This year, leading his team to a 25-5 mark, he averaged 15 points, six rebounds and two assists while taking his team to the sectional finals where they lost to CPCI. Playing out of position in the post, he is a sweet-stroking shooter that's smooth from the perimeter. He finished his career with 1,182 points as a three-years varsity starter. Uncommitted. Averaged 23 points a game as a strong interior presence, but also showed the versatility to operate from the perimeter as well. Was the leader of one of the state's top 10 teams. Was an integral part of both this years team and last years Elite Eight qualifier as the second leading scorer behind his best friend, Nick Brooks. His team was upset against Mt. Carmel (at Lawrenceville) in the regional finals on a last-second shot. Committed to Indiana State.